The National Museum of Ireland and the proposed takeover of some of its facilities by Seanad Éireann. How did this come about, and what are the implications? The proposed move of Seanad Éireann into the National Museum of Ireland (NMI) in Kildare Street, Dublin, has been a subject of increasing public concern this last week. However, the story actually goes back to earlier this year, if not beyond. We can begin the story, for the moment anyway, on June 17, 2016, when the Dept of Arts, Heritage, Regional, Rural and Gaeltacht Affairs website announced that Minister Heather Humphreys had appointed a new board to the National Museum of Ireland (NMI), to be chaired by Catherine Heaney. The new NMI Board included a range of people with different professional backgrounds, from the PR industry, museums’ sector, business and academia. Almost two years previously, Minister Humphreys had been embroiled in a political controversy about Board appointments, and the policy decision to appoint Board members to state bodies after due applications, and on their professional merits, without any questions of political connections, was generally widely welcomed. It is a story that had been rumoured for months in Irish archaeology, and it was occasionally reported upon by some journalists, including Justine McCarthy and Aaron Rogan for The Times (behind paywalls). On July 16, Sarah Bardon wrote a news piece for the Irish Times reporting that the Minister of State Sean Canney, with responsibility for the Office of Public Works (OPW) had questioned a plan to temporarily move the Seanad to the National Museum in Dublin at a cost of €1.7 million, saying “we cannot spend that kind of money.” He said that alternative sites should be examined to accommodate the Upper House. Minister Canney said “To spend €1.7 million to relocate 60 people for two years is an extraordinary large sum of money….we have to consider whether this is value for money and if there are other options“. Dr Michael Ryan, formerly President of the Royal Irish Academy and former Director of the National Museum of Ireland wrote a letter to the Irish Times for July 28, 2016 that summarised the potential harm that would be done. “…History does not encourage those who care about the national collections to hope that this time the museum, strapped for staff, money, space and administrative esteem as it is, will be spared…. In the 1960s the much-loved fossil hall was taken and demolished to provide a Dáil restaurant, and the geology collections disappeared from public view and haven’t been seen since. A little later a substantial room was taken to provide a temporary Dáil bar while security considerations in the 1970s caused the last (staff) link between Kildare Street and the Natural History Museum to be closed. The actions of the NMI Board Chair and the Board members in their acquiescence to this request has been a subject of discussion amongst many archaeologists this week. It is something that will no doubt deserve further, deeper investigation by others as to how, and why, the NMI Board made this decision. No doubt there were questions of funding and resources to be considered. It will be interesting anyway to hear what pressures the NMI Board-and indeed NMI staff-were put under throughout this process. In any case, as is now well-known (but was far less well-known until the former Director of the NMI, Dr Pat Wallace did us all a service by speaking about it publicly on RTE’s Morning Ireland radio programme), it quickly became clear that planning had been underway for some time to have some of the National Museum of Ireland’s spaces taken over for use by Seanad Éireann, as the latter’s debating chamber is refurbished. As readers of this occasional blog will know, or readers of my OpinionPiece in the Irish Times last Monday 24 October 2016 will know, I am strongly of the view that Seanad Éireann is an integral part of our democracy. The Irish people voted for its retention in a referendum—indeed, I voted for it myself. But I and many others think that the proposed move of Seanad Éireann into the National Museum of Ireland will be very damaging. There have been various reports about what the intervention would entail, including the provision of a lift for the Senators, and the establishment of a walkway, atrium, meeting room and fire escape. An Taisce came out in opposition to the temporary relocation of Seanad Éireann to the National Museum, pointing out that it represents a change of use for the museum, and so requires planning permission. The growing public concern could be seen in letters to the Irish Times throughout the week after the story became more publicly well-known, such as here and here. As many commentators stated, not least former Senator John A. Murphy here, there were sensible, less expensive and more politically appropriate solutions within Leinster House. The Board of the Institute of Archaeologists of Ireland wrote a letter to the Irish Times opposing the plan here. The growing resistance to the move could also be seen in a number of petitions seeking a rethink, including a respectful plea to the Minister and organised by Queens University Belfast PhD scholar Rena Maguire here on change.org, and the most recent and active petition being that one organised by the Irish Arts Review which can found-and signed-here. So, let us say it again. As important as the Seanad is, the National Museum of Ireland is one of our premier cultural heritage institutions, the place where the deepest and oldest memories of the people of Ireland are kept. People have been on this island for at least 10,000 years, since the first hunter-gatherers landed on our shores at c.7,800 BC—and perhaps earlier. Through the subsequent thousands of years, the peoples of this island built and lived in houses, managed animals and crops, made and used things, and buried their loved ones in their graves in the landscapes around them. Down through the centuries, peoples, ideas, things and animals were brought from other lands, and similarly the peoples of this island went out into the world. The objects and materials held and displayed in the National Museum of Ireland help us remember where we came from, and how we have been part of the wider world. The responsibilities of the staff of the National Museum of Ireland include the care, management and protection of our archaeological and material culture heritage, and as importantly the communication of knowledge about this heritage to the widest possible audience, both in Ireland and to people all over the world. Thousands of people come through the Museum every year, from all over the world. Its exhibition, conference, and educational spaces are where we teach our children about our ancient past, as can be seen by the throngs of school children and students that move though them every day. I am now a Professor of Archaeology, but many years ago my father used to take me around its exhibitions. He was studying Archaeology at UCD at the time and amongst my earliest memories are a little stack of Late Mesolithic chert Bann flakes, from what was thought then to be amongst our earliest archaeological evidence. It was my Dad’s opinion that everything in the National Museum of Ireland actually belonged to us, the Irish people. He was right: our archaeological legislation is amongst the best in Europe. The objects in the National Museum of Ireland are indeed ours, held in trust for us by the state. The National Museum of Ireland is our Museum. It is now becoming clear to everybody that the impact of the proposed move is drastic. It will require the complete take-over and alteration of at least three large rooms (Japanese Room, Ceramics Room, Chinese Room), essentially the entire upper wing of the Museum. It may or may not involve the construction of a lift, which would be of minimal benefit to the Museum itself. It is also now rumoured that there will be further intervention into at least two or three further rooms on the opposite wing (the current Viking AVC room, as well as the NMI Boardroom and NMI Director’s Office), and generally a complete disruption of the work of the Museum’s staff and their work. It has been politically spun that this is all a “financial investment” into the Museum, and that payments to the Museum are a recompense for the disruption. This is all nonsense of course. If the state actually wished to invest in the NMI, then it could do what was done at the National Museet, the National Museum of Denmark, at Copenhagen. It could do what was done at the Museo Arqueológico Nacional, the National Archaeological Museum, in Madrid, Spain, where a genuine financial investment led to a wonderful redesign of an ancient building that must be a pride of Spain. Watch the video here and imagine what our National Museum of Ireland in Kildare Street might be if it was genuinely supported. Instead, we can only suspect that the NMI staff find all this cynical spinning and all the uncertainty to be demoralizing, and if they are disillusioned about the state’s lack of support for their work, you can see why. So, it would be good if we could hear a bit less about how all this is an “investment” in the Museum. Everybody understands what is going on. The works are intended to provide only for the Seanad and every other intervention is a direct consequence of this. The financial cost of this proposed move of the Seanad into the National Museum of Ireland remains unknown. Will it be €1.5million, €1.7 million, or €2 million – or will it creep upwards as the work progresses? Is this a justifiable expenditure of public money for a temporary move of the Seanad into the museum, when other cheaper options could be available? Finally, nobody in Irish archaeology that I have spoken to believes this to be a “temporary move”. The Seanad might return to their chambers in two or three(?) years, but do we seriously think the Oireachtas will leave its walkway, lift, atrium, and brand-spanking new, technically well-equipped rooms in the NMI? Is it not more likely that in about a year we will start hearing talk of the exorbitant financial waste that would be entailed if the Oireachtas left this excellent new facility only a year after it had spent a large amount of public money on it? The National Museum of Ireland, where our ancient material and cultural heritage is kept, has been beggared by ruinous financial under-investment and budget cuts. We know that the proposed move will have at least a damaging, if not a destructive, effect on the educational capacities of the Museum. It certainly involves a complete loss of flexible space for children and School groups. It will harm its ability to host conferences and seminars for the public. It will entirely remove any capacity it might have to offer temporary exhibitions, workshops and other activities. As importantly, it will continue to disrupt and demoralise its staff, hard-working, conscientious and passionate individuals who have dedicated their working lives to caring for and communicating our cultural heritage to Ireland and the world. There is no need for this to happen. As I have written before, many of us believe that this expensive and damaging intervention will be harmful in the short-term and long-term to the National Museum of Ireland’s duties, responsibilities and obligations, its staff and their resources, and the public’s use of its own institution’s exhibitions, conference, and educational spaces. It is our National Museum of Ireland after all. It is time to call stop on this proposed move and to think again. And perhaps it is also beyond time to start a serious public debate about what a proper investment in the National Museum of Ireland’s Archaeological facility in Kildare Street would actually look like? The National Museum of Ireland in Kildare Street, Dublin, is one of our premier cultural heritage institutions. It is the treasurehouse of our national archaeological collections amongst other things. It is the place where we keep the things that can be used to tell the story of our 10,000 years on this island. The National Museum of Ireland’s and its staff’s responsibilities are enormous; including the curation, management and protection of our archaeological and material culture heritage, and the communication of knowledge about this heritage to the widest possible audience, both in Ireland and to people all over the world. It is also a place for the education of our children about our ancient past, as can be seen the throngs of school children and students that move though it every day. It was recently reported on Tuesday 18th October 2016, in a radio interview on RTE radio’s Morning Ireland with the former Director of the National Museum of Ireland, Dr Pat Wallace, that it is proposed that the National Museum of Ireland will have some of its exhibition, conference, and education spaces taken over to be used by Seanad Éireann, as the latter’s debating chamber is refurbished over the coming years. These plans to move the Seanad had been rumoured periodically, and reported on in the media before. Earlier this year, in July 2016, the growing concerns were noted, such as in Senator Aodhán Ó Ríordáin‘s statement in the Seanad on 12 July 2016. Furthermore, similarly serious concerns were expressed about the huge cost (then estimated at €1.7 million) involved in moving the Seanad, 60 people, for 2 years by Seán Canney, Minister of State with responsibility for the Office of Public Works – see his statement here. In response to the growing concerns, Dr Michael Ryan (former Director of the Chester Beatty Library, and former President of the Royal Irish Academy) sent a letter in the Irish Times for 28 July 2016, that you can read here, that highlighted the key problems. John Mulcahy’s editorial in the Irish Arts Review here stated similar concerns. But there was not a lot of more information publicly available. In the last few days, in response to the interview with Dr Pat Wallace, there have been numerous articles and letters in various newspapers and websites (such as here, in the Irish Times, Journal.ie, the Irish Examiner, Evening Echo), and on social media. Several people have written letters to the Irish Times, which you can read here and also here protesting the move, and there is even now an online petition started seeking changes in the plans. The story has also started to generate news in international media, for example see here. There are a few questions that need to be asked. 1) What is the financial cost of this proposed move of the Seanad into the National Musueum of Ireland? Will it be €1.7 million, or €2 million – or more, after extra architectural and technical works are added on? Is this a justifiable expenditure of public money for a temporary move of the Seanad into the museum, when other cheaper options could be available (see below)? 2) How much space will be taken from the National Museum of Ireland? Will it be more than one room; will it be two, will it actually be three rooms? While it has be widely reported that the move is to the ‘Ceramics Room’, in fact it seems that there is an intention to take the ‘Japanese Room’ (the room above the current Museum Cafe) to provide an entrance or atrium for Senators so that they do not have to move through the public; the ‘Ceramics Room’ (the large space currently used by NMI for its conferences, seminars, temporary exhibitions, public outreach and educational activities for adult and children), and the ‘Chinese Room’ (where NMI Dept of Antiquities staff currently have their offices for their day to day work). So that’s three rooms, not one. This will obviously also entail a disruption of NMI staff as they move to offices elsewhere, and presumably this will entail further loss of public exhibition spaces elsewhere in the NMI. 3) Indeed, why is the National Museum of Ireland and its facilities being used to sort out problems of space in the Oireachtas? It is important to state that Seanad Éireann as part of our Oireachtas is an important part of our democracy, its retention was voted for by the Irish people in a referendum, and it is clearly the case that Senators serve their country patriotically and well. There is no need to imply that their work is not valuable and important. But are there seriously no alternative spaces in Leinster House that could be used? Would a more pragmatic and cost-effective solution not be both less expensive and less destructive of the National Museum of Ireland’s capacities? There is the Dáil chamber itself; with proper scheduling could the Seanad not meet when the Dail Chamber is empty? Are there not other large rooms in Leinster House, such as the Committee Room 1 that could be used (apparently it is roughly the same size as the Seanad chamber, already has TV cameras, sound and recording equipment)? Finally, are there no alternative spaces in Dublin city centre-one could easily list off Dublin city centre conference facilities, Dublin Castle, Dublin City Council’s chambers, etc? In any case, this is a problem for the Oireachtas, why should our National Museum of Ireland be the solution to a lack of space in government buildings? 4) Is this move going to involve the physical intervention into, and alteration of, despite planning regulations, of a protected 19th century structure? There have been some comments that this work is an “investment” in the National Museum of Ireland’s facilities, and also some reports of payments to the Museum. After several years of serious budgetary cuts and ruinous financial under-investment, any such payment to the NMI can only be a fraction of what it needs, and cannot begin to replace what they’ve lost in recent years, and the staff that they have lost. Setting that aside, are the physical and technical alterations of the museum building and its rooms actually useful for the National Museum of Ireland in the future, or not? Does the NMI really need a political debating chamber, with its bangs and whistles, or does the NMI need actual investment suitable for a 21st century museum at the heart of the city? Will the Seanad’s debating facilities be removed when it leaves, if it ever does (and there are dark suspicions that this move may yet prove to be permanent)? If they are to be removed in a few years, are these alterations not a massive waste of public money? €1.7 million? €2 million? More? If it is actually intended to not return the spaces to the National Museum of Ireland, as is suspected by many, then talk of this move being temporary is disingenuous, and represents a confiscation of our premier cultural heritage institution’s scarce facilities. If this development cannot be stopped, then can we see the written guarantees, the publicly made promises, that the Seanad will indeed depart the National Museum of Ireland in two years time? Without them, any talk of ‘temporary move’ has to be regarded as untrustworthy. Amongst the alterations, it is apparently proposed that there be a lift installed, something which the NMI has rightly sought for decades, for people visiting with mobility issues, for parents with small children in buggies, for the staff moving materials, etc, but now suddenly when Seanad requires it, a lift can indeed be installed. 5) Finally, what will be the impact of this extremely expensive and damaging intervention on the National Museum of Ireland’s duties, responsibilities and obligations, its staff and their resources, and the public’s use of its own institution’s exhibitions, conference, and educational spaces – often used for children’s events? This is our National Museum of Ireland. It holds our national archaeological collections. It is a place for us to communicate our cultural heritage to the rest of the world, and to our children. It needs our support, now more than ever. Ireland’s famous sports of hurling and camogie are stick-and-ball games played respectively by men and women, mostly on this island but increasingly abroad. The games are administered by the Gaelic Athletic Association (GAA) and the Camogie Association. Two teams of fifteen players each, oppose each other on a large, rectangular pitch with goals at either end. The games, when played at the top level, and you can watch a fantastic 2013 All-Ireland Hurling Final with Clare vs Cork game on YouTube here, require players with a high degree of personal skill and physical coordination, as well as speed, agility, quickness of thought and action, and no little courage under a dropping ball with sticks flailing. Hurling and camogie are games that inspire great passion and affection, and down through the years, its followers have tended to argue that hurling (I will use that name from now on, but what lies below applies to camogie also) is a game of immense antiquity, with roots deep in Irish prehistory. In reality, the modern sport of hurling was largely codified in the late 19th century, and has indeed itself evolved through the 20th century, and even in this decade, in terms of rules, equipment and tactics. However, we also have definite evidence for the playing of several different stick and ball games in the early medieval period (i.e. AD 400-1100, the later Middle Ages and then up to the modern period, and the challenge is to understand what these games might have been like. In exploring the earliest evidence for hurling in Ireland, we have a limited range of sources. 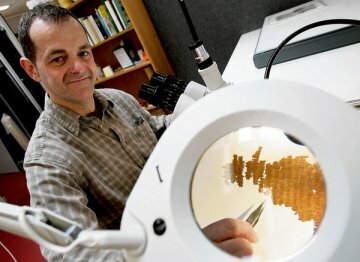 There are increasingly hints from archaeology, for both the character of the stick and ball, but our best evidence comes from early Irish historical sources and particularly early Irish laws dated to the 7th/8th century and early Irish narrative literature or sagas, dated to across the medieval period. These legal and literary sources give us our best sense of the equipment used, the stick and the ball, the playing areas (known in Old Irish as the faitche or cluichemag), as well as the game’s strategies, players, teams, and the injuries suffered both by participants and spectators. A number of scholars have previously looked at the history of hurling, notably Liam O’Caithnia, Art O Maolfabhail and Seamus King. All of them provide particularly good and important studies of the development of hurling in the 17th-19th centuries, but perhaps – and this is not meant as a criticism – they tend to present very simplistic views of hurling in the medieval period. Most importantly, they tended to conflate and combine descriptions of possibly quite different games from different source, make them into one, and claim that this was “hurling”. Probably the most important recent scholarly work then has been Angela Gleason’s, who completed a PhD in the Dept. of History TCD in 2002, entitled “Entertainment in early Ireland” (and I’m delighted to acknowledge Dr Gleason for allowing me to read her thesis in 2009). One of the key points that Dr Gleeson makes is that all modern historical studies of hurling have tended to be heavily influenced by the GAA’s origins and development in the cultural and political nationalist movements of the late 19th century and 20th century. She has argued that historians of the GAA in attempting to identify the origins of hurling in the games of antiquity, may have bundled together potentially quite different games and presented them as one single game. The early medieval historical evidence might suggest that in fact people played quite a range of field sports and games, each of them with their own equipment, strategies and participants, some of which might have been like hurling, whilst others may have been quite different. One of the problems in reconstructing the games as they were played is that the audiences of early medieval storytellers and writers would have been quite familiar with the games, so they would not have felt the need to explain the rules, tactics and complexities of the game. Thus phrases are used in the early medieval texts which we might struggle to understand, not having that easy familiarity all our lives. Indeed, imagine if a person today, entirely unfamiliar with modern hurling, read in a newspaper that “Joe Canning got the sliotar at the edge of the square, and stuck in the roof of the net”. Their reaction might be: “What’s a sliotar? What was the square? Why did he put in roof of the net, and how does one do that anyway? !” In the same sense, we are trying to reconstruct an ancient game from short pieces of text, intended for people who knew more than we do. Horlinge then in the 14th century then was a native, Irish game played with great sticks and a ball on the ground. Now, this is important, because in recent years we have confirmed archaeological evidence from the 15th century and before that, for sticks and for balls that would fit this description. In other words, we have definite historical and archaeological evidence for a type of game, known as hurling/horlinge, in the late medieval period. The evidence also fits well with what we know of earlier games, before the 10th century. On balance then, I think that the early medieval stick and ball games described in the sources are indeed ancestral to modern hurling, albeit different in many ways, and the experience of both playing and watching them would not be entirely strange to a modern observer, and certainly not strange to someone playing the game of hurling in the 18th or 19th century in parts of the country. This can all be well-illustrated by a consideration of the most famous and most often quoted source about early medieval hurling; the Táin Bó Cuailgne and particularly the boyhood deeds of the hero Cú Chulainn (originally known in boyhood as Setanta). Although more recent, popular versions are available, the scholarly work is that of Cecile O’Rahilly who published academic editions/translations of both recensions, including her Táin Bó Cúalnge from the Book of Leinster (1967) and Táin Bó Cúailnge Recension 1 (1976), as well as an edition of the later Stowe Version (1984), a variant version of recension 2 in more modern language, with a few extra passages (see here for a discussion of versions and translations). In any case, descriptions of early medieval field sports, some of which are very like hurling, are found in two main versions of the Táin (and again, I am indebted to Angela Gleason for her previous analysis of the texts, with my own occasional comment). The earliest and simplest descriptions (in Old Irish) are found in the Leabhar na hUidre (the Book of the Dun Cow, hereafter LU) dated to the early 12th century. …the little lad asked his mother if he might go to play to the playing-field at Emain.. The boy went forth and took his playthings. He took his hurley-stick of bronze and his silver ball; he took his little javelin for casting and his toy spear with its end sharpened by fire, and he began to shorten the journey (by playing) with them, He would strike the ball with the stick and drive it a long way from him. Then with a second stroke he would throw his stick so that he might drive it a distance no less than the first. He would throw his javelin and he would cast his spear and would make a playful rush after them. Then he would catch his hurley-stick and his ball and his javelin and before the end of his spear had reached the ground he would catch its tip aloft in the air (From O’Rahilly, C. 1967 Táin Bó Cúalnge from the Book of Leinster, Dublin Institute for Advanced Studies Táin LL, trans. 158-59). Lebor Laignech version (late 12th cent) “He took his hurley-stick of bronze and his silver ball (Gebid a chammán crédunma 7 a líathroit n-argide); he took his little javelin for casting and his toy spear with its end sharpened by fire. We can see straight away that there are several important words in the various recensions of the Táin texts; lorg áne means literally ‘driving-stick’ and is used in LU (but O’Rahilly translates it as ‘hurley’), while LL uses the term ‘cammán créduma (which O’Rahilly translates as ‘bronze hurley’, following the modern Irish word cammán, which means literally ‘little bent thing’). The texts go on. On his way to Emain (in LL), Cú Chulainn amuses himself by striking the ball with his cammán so that it flies a great distance. He then throws his cammán after it, once again striking the ball and driving it a distance equal to the first. He completes the trick by throwing his javelin after it, catching all of them before they strike the ground. So, here we get a clear description of the use of a stick (lorg áne or cammán) to hit a ball (liathróit) and interestingly, the stick is used to hit the ball up into the air rather than simply along the ground. LL They cast their thrice fifty hurley-sticks (trí coíctu cammán) at the boy’s head. He lifted up his single plaything stick (óenluirg n-ánuisa) and warded off the thrice fifty sticks. Then they cast the thrice fifty balls at the little boy. The use of another word, óenluirg n-ánuisa is interesting, and may simply be the use of different words to provide variety, but Angela Gleason has suggested that this may indicate that being of different status (an unfostered youth, unlike the boys) he had a different stick. Cú Chulainn uses his lorg áne in other activities, mostly violent, elsewhere in the Táin. In one episode from LU, he meets a man carrying his brother on his back, but refuses to help him and the man attacks him. LU “Wherepon Cú Chulainn rose to his feet, and striking off his opponent’s head with his hurley, began to drive (imáin) the head like a ball before him across the plain’. However, the picture gets a little more complex when we realise that in another part of the Táin, there is a description of the boys gathered on Conchobar’s playing field at Emain, to play cluchi puill (‘hole game’). It is all very impenetrable, but this and other passages from an Old Irish law tract known as Mellbretha, suggests the existence of a playing field with separate places, boundaries and divisions, and that a ball is driven from one place to another, and defended. On the other hand, its possible that the same place and equipment were used for the ‘hole game’ as the previous ones, much like say boys and girls might play penalties today, and use a number of different balls, as one boy or girl defends the goal. It is in principle the same sport, but is a different type of contest. In any case, the Táin gives us a strong sense of a stick and ball game, the equipment used, possibly the tactics, the means of scoring and the venue, which we turn to now. The early medieval sources give us a strong sense of where field-games were played and most often use the terms ‘faithche’ (green) or cluichemag (sports field), and this is particularly so in the Táin. In the Táin, there is a clear sense that the game is played in a specific space close to the king’s household at Emain. The Book of Leinster version uses the words faithche (‘green’) and cluichemag (‘sports field’) to describe the place where Cu Chulainn and the boys of Emain play. In the Middle Irish Tóruigheacht Dhiarmada agu Ghráinne, the king of Ireland holds a contest of ‘driving (iomáin churmórtuis) during a fair (áonaigh) on the green at Tara. The use of the word ‘driving’ is interesting obviously, as well as the fact of a competition, and a venue. Other early Irish legal sources all stipulate that a green or faithche was a place where people could play field-games (cluithi) and horseracing (graithfne) and that they would be legally immune from fines for damage to property if this was what they were doing. For example, Angela Gleason notes in her PhD that a passage in the law tract, Bretha Éitgid states that anyone who causes damage or injury from striking a ball on the green of the chief-enclosure (faiche primcathrach) is exempt from fines as such open spaces are free. However, if small boys caused destruction by driving balls (imain na liathroiti) outside the green (secharfaiche), they – or their parents or foster-parents – would have to pay compensation. The law tract, Bretha Éitgid also defines various legal liabilities if the ball lands outside the green; including considerations for the retrieval of the ball; permission to enter private property; permission to open any fence or gap to retrieve a ball and care to secure such a barrier upon leaving. So, a strong sense that the playing-field was bounded in some way. There is even a sense that spectators gathered in particular areas to watch the game on the playing-field, much as in the Táin where it says the Conchobar spends a third of his day watching the drivings (immánae) of the boys on the green. Indeed, there are even legal passages that discuss circumstances where spectators might be compensation for injuries received while watching a game. The descriptions of games at Tara and Emain Macha certainly indicate that part of the spaces around them were used for games, but we can also identify other archaeological sites in Ireland where we can see hints that a royal stronghold or fort had a green or faitche beside it. For example, on Lough Derravaragh, Co. Westmeath, there is a likely royal crannog and ringfort at Coolure Demesne. UCD School of Archaeology’s investigations have dated this crannog to the between the 5th and the 9th century AD, and a range of finds indicate that it was a high-status site, possibly that of the Uí Fiachrach Cuile Fobair, a minor local dynasty in Mide. The local townland may preserve in its outline the estate associated with the royal residences and would certainly provide a suitable space for a green or playing field. Similarly, in Co. Westmeath, we have the known early medieval royal residences of the kings of Clann Cholmáin, one of the most important groups of the Southern Uí Néill, and ultimately holders of the kingship of Tara. At their royal crannog of Cro-inis, and their royal fort at Dún na Sciath, there is an interesting exclusion zone to the north, where there is a complete absence of any early medieval settlement enclosures. It is also incidentally, a level, grassy sward that again would make an idea playing field. Although we have no way of proving it, it is likely that this space was the location for games, horse racing and public assemblies associated with the king during the early medieval period. Photos (top) and map (above) showing the early medieval royal residences, Dun na Sciath and Cro-inis, of the kings of Clann Cholmain, of Mide, on the west shore of Lough Ennell, Co. Westmeath. An expanse of grassland to the north of the royal complex would be highly suitable for the extent of a faithche. (Colour photo and map, Aidan O’Sullivan; black and white photo in 1969: Cambridge University Committee for Aerial Photography). What were the playing sticks – the lorg ané and cammáin – like in early medieval Ireland? So, what were these playing sticks like, and did they bear any resemblance to the hurleys that we know from more recent times? Well, we can see today that hurleys are both regional in style, and that they have changed profoundly even within the 20th century, so its likely that lorg áne – the driving stick – and cammáin – little bent thing – in early medieval Ireland were probably variable. There are regional styles in Wexford, Kilkenny, Galway and elsewhere today, so why not in the past? We have for example, the very recent O’Connor style hurley, initially used by Cork hurlers but now increasingly by most county teams, with its pronounced heel, which is very much about the modern style of game which is largely played from the hand and thus emphasises the ‘sweet spot’ in the middle of the bas, for striking the ball from the hand. Moving backwards to the 1950s, for example, we can see that hurleys used in Clare by my father, shown in the photograph of the Clare hurling team were quite different again – with sticks that were principally for ground hurling. My father, John O’Sullivan (back row, second from right) on the Clare senior hurling team in the mid-1950s. In the foreground you can see his team mates’ hurleys, which with their narrow bas are of course designed largely for ground hurling and are very different from the stick used today. (Photo: O’Sullivan family). Moving backwards again to c. 1900, we can see in this image of a hurley found at Michael Cusack’s house at Carron and currently held in Clare County Museum, that sticks consistently had a long, narrow boss. Going back further in time, the National Museum of Ireland’s Folk Life Collection also has a collection of hurleys, some of which might well be early in date although most probably date to the 19th century. These vary in style, There are also various depictions used by Art O’Maolfabhail, going back through 1840s to 1805 – which might or might not be accurate drawings – of hurley sticks in the 19th century. Hurleys from the late 19th century and early 20th century. To the left, one Patrick Kenrick, Fethard, c.1900, from a photograph held by the National Library of Ireland, to the right, an image used in his book by Art O’Maolfabhail from the National Museum of Ireland’s Folklife Collection, showing a range of hurleys from different parts of the country. At this point, we might also mention Art O’Maolfabhail opinion that there was originally a northern ‘winter hurling’ and a Leinster ‘summer hurling’, with the GAA largely adopting the latter on its formation in 1886. We can push this discussion of the development of hurling sticks by mentioning the very earliest artistic depiction we have of a stick, which is on a late medieval grave slab found at Clonca, on the Inisowen peninsula, Co. Donegal. This grave slab was made, probably in Ireland, for one Mánas mac Mhoireasdain of Iona, in a west Scottish style. It depicts a late medieval – 15th century – sword, as well as a long, thin playing-stick with a curved end and a ball beside the tip. The iconography of the slab would be intended to portray his masculine strengths and his cultural background – and it has often been seen as a depiction of a stick like that used for ground play, as in modern shinty. Finally, most importantly, the earliest archaeological evidence of an actual stick that we have is a hurley made of alder-wood, found in a bog at Derries, near Edenderry, Co. Offaly and held in the Folklife Collection of the National Museum of Ireland (F:1981.160). Hurley found in a bog at Derries, near Edenderry, Co. Offaly, and radiocarbon dated to the 15th-17th century AD (Photo: National Museum of Ireland Folklife Collection, with thanks to Clodagh Doyle). This was also a stick with a narrow bas or playing end, measuring 94.5cm in length with a maximum width of 6.5cm. It has been radiocarbon dated to345+/- 24 BP, which would be calibrated to 2 sigma c.AD 1467-1635. In other words, a date somewhere from the late 15th to early 17th century (with my thanks to Eamonn P. Kelly and the National Museum of Ireland for the c14 dates). The National Museum of Ireland, in collaboration with the GAA Croke Park Museum, have a nice video about the hurley and an account of the hair hurling balls here with commentary by Clodagh Doyle, and the Director of the NMI Raghnall O’Floinn. But, what were the early medieval lorg ané and cammán like? Moving backwards in time again, back a thousand years ago; What was the lorg áne (driving stick) or cammáin (little bent thing) like in early medieval Ireland? The sources give some hints. In the Táin, the stick was clearly used to propel a ball across a field, and potentially to lift and strike it into the air – which would certainly imply a broad boss. It is most likely that these sticks were made of wood, possibly even ash or alder which was often used for spearshafts and handles.Otherwise, the sources tend to focus on what else might be on a stick. …7 airget aru faighnibh 7 credumu aru cumanaibh, 7 sdan aru faignighib o sin imach 7 umhu aru cumanaibh. …and silver upon their (sons of a king) scabbards and bronze upon their playing sticks, and tin upon their (sons of a lord) scabbards in the same way and copper upon their playing-sticks. (CIH 1759.17-18, trans. Angela B. Gleason 2002 Entertainment in early Ireland PhD thesis, Trinity College Dublin). We have no idea what precisely this ‘ornamented’ means – these could be bands to strengthen the cammán, but they could also be decoration on the handle. Law tracts and saint’s lives commonly rank objects according to class and it is impossible to say if these are accurate descriptions. They may be fantastic items, not really found in real life. Angela Gleason also notes that in a Middle Irish tale from the Book of Leinster, one character named Crimthann receives a stipend of fifty bronze playing sticks and balls (cammán creduma co lliathroitib credumaib). Clearly though, the ownership of a cammán was expected of boys of status. That the cammán was an item of personal property can also be seen in a fragment from an Old Irish law tract known as Mellbretha (“sports judgements”? ), which describes field-games and liabilities for injuries, based on age and presumably status. “If a boy finds or takes a cammán or lúbóc that is not his own; if he is later found with it, there is no retribution; i.e. he simply gives it back and there is no further penalty (“if it be a lúbóc or cammán which is found or taken and they are found there with him, that which is taken stands as retribution”. In another old Irish law tract, Cetharslicht Athgabála, it is stated that children’s playthings should not be distrained – these being “playing sticks and balls (camana 7 liathroiti), and Lúbóca, or cats…” Angela Gleason has argued that the reference to an object known as a lúbóc – and the fact that this is in juxtaposition with cammán – indicates that there is possibly another ball game to be considered. A lúbóc would appear to be a circle or ring through which a ball might be played, a hoop of some description. There is other evidence to suggest that it simply is another game, not related to the ‘driving game’. We have some further evidence for what these lorg áne and cammán looked like. There is intriguing evidence for the depiction of ‘driving sticks’ on early medieval high crosses at Kells, Co. Meath and Monasterboice, Co. Louth – a fact that was first noted by Art O Maolfabhail in 1973. Early medieval high crosses were large decorated, ornate stone crosses located at key locations in early monasteries and may have been a way of illustrating stories and events from the bible to a largely illiterate population. The scene of David slaying the lion depicts David as a shepherd killing a lion with his bare hands. On the early medieval Kells Market cross, Co. Meath and on the early medieval west cross at Monasterboice, Co. Louth there is a carving of a curved object associated with a circular object – and these is often interpreted as a shepherd’s crook or a sling with a sling stone. However, slings were not typical weapons in early medieval Ireland, or at least they are not commonly mentioned, and we may be looking here at a ‘driving stick and ball’. Now why would David be holding a driving stick and ball? Well, it is intriguing that about the same time as these early medieval high crosses were being erected and used in monasteries, the saga of the Táin Bó Cuailgne was being written down. In the boyhood deeds of Cú Chulainn, there is a well-known incident where the boy Setanta gains his new name Cu Chulainn by killing a ferocious beast. In this episode, Setanta is travelling late to a feast, following on from the king Conchobar, as he had been playing on the fields at Emain. In both versions of the tale, he passes the time on his journey using his playthings, and in LL, he is again using his hurley and ball. When he arrives at the fort, he finds that a fierce hound is about to attack him. In both LL and LU, he throws the ball down through the hounds throat before picking him up with his bare hands and smashing him against a pillar stone, i.e. it is not stated that he used his hurley. It is possible that people in early medieval Ireland would have been thus familiar with a motif where a hero kills a fierce beast – and more familiar with the Cú Chulainn episode than a biblical one – and so the artists depicts a camán and liathroit, rather than a shepards crook or sling. It is admittedly, tenuous: but it’s a possibility (and see Dr Andrew Halpin’s comment below, arguing that they are indeed slings). What was the early medieval liathróit like? The early medieval historical sources also give evidence for the character of the ball used in the games. The modern sliotar or hurling ball is of course made of leather and cork. In the 19th century, hurling balls were often made of wood (cnag), the roots of furze/whin bushes, leather, horse or cow hair and woven straw and were often used as betrothal gifts from young women to young men, or as part of Mayday festivities (see the National Museum of Ireland’s website here. The Lavally ball illustrated below was made of felted cows hair, covered by a network of fine cord of plaited long tail hairs of horse. These balls were often deposited in bogs, occasionally situated at depths indicating at least some antiquity, possibly from the late medieval period – but now we have definite evidence through the National Museum of Ireland’s work, of early examples of ‘hurling ball’. The National Museum of Ireland’s radiocarbon dating has placed several balls back to the 12th/13th century AD. The early medieval historical sources can be a bit graphic, if fantastical, in their descriptions of hurling balls. Some of the sources claim that balls were created out of the brains of enemies. In the Middle Irish Aided Conchobuir, it is stated that “At that time it was a custom with the men of Ulster to take the brains out of the head of every warrior who they slew in single combat, and to mix lime with them so that they were made into hard balls. And whenever they were in contention or at comparison of trophies, these were brought to them, so that they had them in their hands.” There are similar mentions of balls made of brains in other sagas too, as well as the Táin. They may of course be entirely fantastic. To conclude – what about players, teams and strategies? So much for sticks, balls and playing grounds, what of the nature of these games; how were they played; what was their goal, how were they organised in terms of teams and rules? Well, we have real problems in reconstructing these, because the sources are vague, they often only hold snippets of information, and they amay be as Angela Gleason has argued, be referring to potentially different field games. The term immáin simply means ‘driving’. Is this hurling? It is intriguing though that today we might say that a corner-back in a hurling match might get the ball and “drive it down the field”, so perhaps we should be cautious about being too literal about words (you will also hear the shouts of “drive it!”, “pull on it”, “timber him!”..ok, I only heard the last phrase in north Tipperary in the 1980s, but how would we understand phases like this if we did not know the game?). So, the terms lorg áne and cammáin may literally mean ‘driving stick’ and ‘little bent thing’. Are these hurleys in the modern sense, almost certainly not, as we have already shown the development of hurleys across time – but it is not unlikely that early medieval sticks looked much like the later medieval ones from Clonca and Derries. The saga-literature implies that the game known as immáin (‘driving’) or áon líathróti (‘ball-driving’) was played on a green. In some sources (Tóruigheachta Diarmait agus Ghrainne) a game could go for days. In the Táin, Cu Chulainn catches the ball between his shins, and despite the tackles of the other boys, carries it ‘across the goal’ (dar brúch mbáire). It sounds like the first goal ends the game. The game as presented in the saga lierature is played mostly by young boys with a ball and playing-stick. The sagas of course are representing an ideal, heroic, military society – so Cú Chulainn is a hero able to beat 150 boys at a game. During fairs and festivals, it was played by men. For example, in Tóruigheacht Dhiarmada agus Ghráinne, a game is being played at the feast of Tara. Diarmaid steps in, grabs the nearest cammán and scores three goals. There are occasional references to otherworldly people playing games. The most famous is in the Middle Irish Cath Maige Tuiread (‘the Battle of Moytura’), when Rad and 27 others challenge the Tuatha dé Danann to a game of immáin and the match ends when most of the players suffer broken arms and legs. Ordinary people undoubtedly played games too. In other sources, such as Tochmarc Étaine, there is a description of 150 youths playing games, and interestingly, there are also references to 150 girls on a playing field. The quality of the skills of some of these players is shown in the Táin, has already been mentioned. A medieval Irish saga, Cath Finntrága, dating to the 14th century, also describes how a foreigner displays great skill in keeping the ball aloft. In this passage, the foreigner takes his caman and ball, hit the ball up the beach, chases after and catches it and then comes up and down the beach with it on his foot, knee or shoulder without letting it fall on the sand. “Thereupon the foreigner doffed his battle-dress and donned a splendid elegant dress and took a club and ball (do gabh caman 7 liathroíd) and beat the ball (ro bhuail an liathrod) from the west of the strand to the east, and he caught it in his right hand before it descended, and he put it on his foot the second time and he sprang in his rushing from the west of the strand to the east, and he threw the ball from one foot onto the other, without touching it with his hand, and without its touching the ground, and he put it on his knee the third time and ran to the other end of the strand and then put it from one knee on to the other, without throwing it on the ground. The he threw it on his shoulder and made a rush like the March wind from one end of the strand to the other, without touching it with the hand, and without throwing it on the ground, and he challenged all the fiann to perform that trick.” Meyer, K. 1885, Cath Finntraga 21. Undoubtedly, a modern referee would have blown the whistle, for carrying the ball more than the three steps…in a tough Junior Hurling match, he might have got himself sorted out for playing ‘fancy-Dan hurling’ (my father, John O’Sullivan, a talented Killaloe Smith O’Brien’s and Clare hurler in the 1950s, told me once of a game where as half-back he came out with the ball, skilfully tipped it over an opponent’s head and soloed down the field before striking it. It immediately came straight back over his head: whereupon his brother-in-law (who played in a more, eh, traditional 1950s Clare style) Tommy O’Brien playing at full-back, came out and buried the opposing forward, before shouting out at my Dad “You and your fancy-Dan hurling!”). Are the hurling or camogie that we see today like the games of early medieval Ireland that are described in the texts? They are not of course: both are codified, modern sports organised by major, sophisticated sporting organisations, and the games have evolved even in our own time in keeping with greater levels of fitness, a flightier ball, and arguably increased skill levels (we regularly see feats in hurling or camogie matches today that we would have rarely seen 20-30 years ago). However, it is undoubtedly the case that hurling and camogie can trace their ancestry in the games played in the near and distant past. In conclusion, every year, in September, we see the modern heroes of the games of hurling and camogie run out onto the cluiche mag of Croke Park, for the All-Ireland Hurling or Camogie Championship finals. The two teams play not with balls made of brains, or use bronze hurleys and silver balls, but they are games to look forward to all the same. The Clare vs Cork All-Ireland Hurling Final of 2013, played out in Croke Park in front of 82,000 people. Hurling and Camogie are amongst the world’s greatest field-sports and are part of Ireland’s cultural heritage (Photo: Aidan O’Sullivan). My thanks to Dr Angela Gleason for permission several years ago to read and cite her PhD thesis on Entertainment in early Ireland. My thanks also to the GAA’s Croke Park Museum for inviting me to give a lecture entitled ‘Cú Chulainn to Canning – Evolution of Hurling from Warrior to Hero!’ in Croke Park, 26th March 2009, from which the above text is taken. My grateful thanks also to Clodagh Doyle, Curator of Folklife Collections, National Museum of Ireland, for information on hair hurling balls and the Derries hurley. Lucas, A.T. (1975) ‘Hair hurling ball from Lavally, Co. Sligo’. Journal of the Cork Historical and Archaeological Society 81, 13–14. 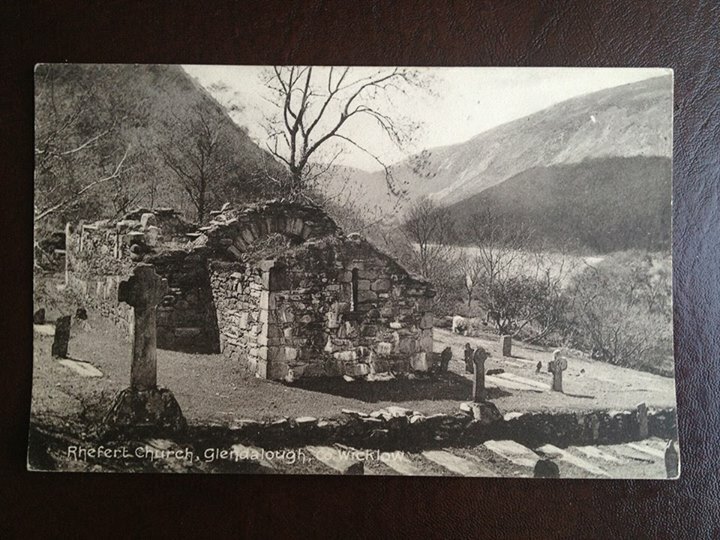 Some months ago now, I bought an old postcard on eBay (it was very cheap – £3.99) of Reefert church (misspelled “Rhefert”) , at the Upper Lake at Glendalough, Co. Wicklow. Although it is a place that I am fond of, having visited it hundreds of times before, I was intrigued because the postcard clearly showed the church in relatively open country, and before its enclosure within oak and hazel woods. 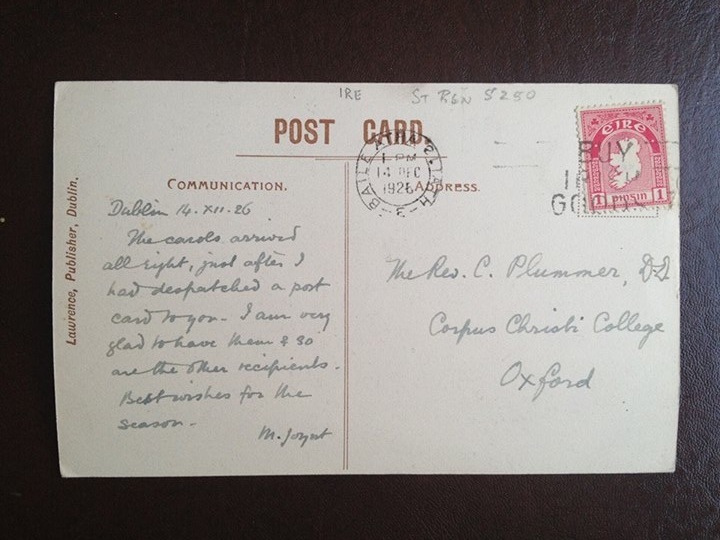 Intriguingly, when I opened the envelope from the eBay seller, I discovered the postcard was posted in 14 December, 1926, to The Rev Charles Plummer, at Corpus Christi College, Oxford. This of course can only be the famous medievalist who is best known in our part of the world for editing the 2 volume Vitae Sanctorum Hiberniae, whose work made a range of medieval Irish hagiographies available to the reader. See here for a brief biography of Plummer. The carols arrived all right, just after I had despatched a post card to you. I am very glad to have them & so are the other recipients. Best wishes for the season. At that stage, I couldn’t figure out the author’s name, but when I posted it on the Early Medieval and Viking Age (EMVARG) Facebook page here, a better-informed colleague Dr Emer Purcell suggested that it was Maud Joynt, a contributor to the Dictionary of the Irish Language published by the Royal Irish Academy and the key work on the origins and character of Old and Middle Irish, (and also a signatory, I see here, of a letter in October 1922 protesting about changes to article 3 of the Draft Constitution “Relating to the Rights of Women as Citizens; Extracts from Clauses in Constitutions of European States Relating to Women’s Rights”). Strangely, but perhaps unsurprisingly (being a woman), there’s not a whole lot about her on the internet. Maud Anna Evans Joynt was a significant early Irish scholar, who as well as contributing to the DIL, edited various Irish texts including Feis Tighe Chonáin and Tromdámh Guaire as well as Echtra Mac Echdach Mugredóin. Dr Sharon Douglas-Greene suggested that the correspondence related to Plummer sending Joynt some “new music for church congregation/choir”, which seems likely. There’s not much more to it than that, except I find it fascinating as an artefact from the past (a material email), and as well as giving me a glimpse of Reefert as it was c.1900, I’m also imagining Dublin just before Christmas, a few years after the war of independence, and two medieval scholars corresponding over something that they had chatted about, presumably during a visit to Dublin by Charles Plummer. I’m also intrigued as to how such an ephemeral item survived Plummer’s death, only a year later in 1927? 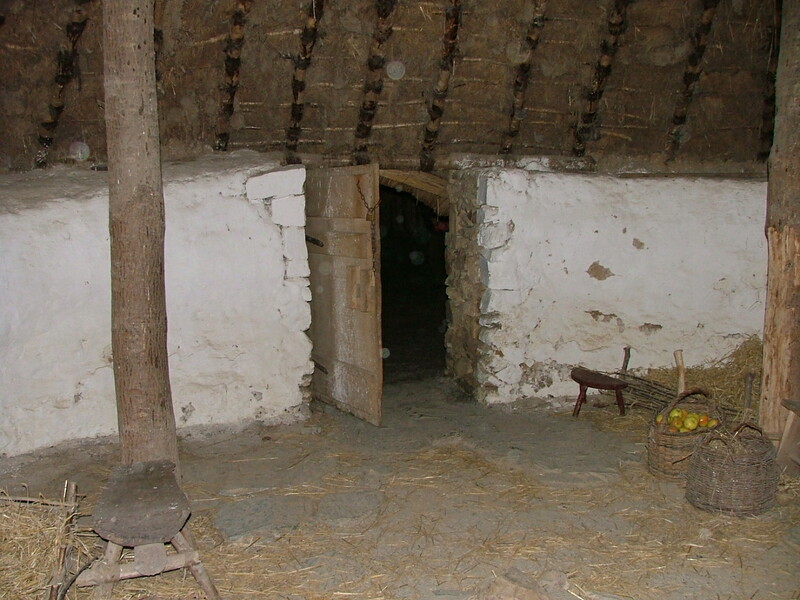 People’s lives in early medieval houses would have been bound around by customary practice, by social norms and conventions, by religious beliefs (such as the thin layer of belief provided by Christianity), but also by superstitions and even a belief in the magical properties of objects. This is hardly remarkable. Some early medieval Christian religious beliefs and practices essentially saw objects as having personality and power and an ability to shape people’s lives – one need only think of saint’s relics and their power. Rather more tricky to identify are the beliefs and practices that people had in their daily lives, that seem to be distinct from early church doctrine. In the past, I have explored the ways in which the abandonment of houses seems to be marked by the deposition of domestic objects, such as rotary quernstones, wooden troughs and plough implements, in pits or wall slots (O’Sullivan and Kenny 2008, 9). These types of objects, used in the production and preparation of food, may have been practically and metaphorically associated with the household itself. At Deer Park Farms, an oak trough (with a wooden shoe last inside it) seems to have been deliberately left behind on the floor of the smaller house (Structure Zeta) of a figure-of-eight house. This wooden trough—which early Irish literary sources would imply was a woman’s property and used for kneading dough or presenting food—was apparently over 150 years older than the house and must have been one of its cherished antiques so its deposition could hardly be accidental (Lynn and McDowell 2011, 130). One could envisage that upon the death of a grandmother, the trough was finally abandoned within a house that had also come to the end of its life. 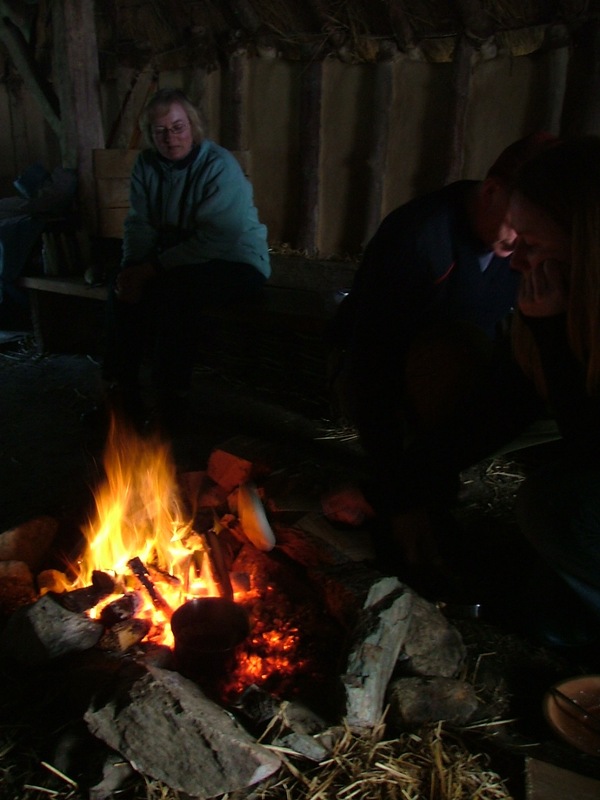 Quernstones were used for preparing bread and cereals (an important aspect of the early medieval diet). In early Irish sources, food preparation was a woman’s task, so it is possible that these objects were associated with a grandmother or mother. At Leacanabuaile, broken rotary querns were placed in the walls of the Phase I round-house that was then subsequently replaced by a Phase II rectangular house. At Dressogagh, two figure-of-eight round-houses were placed on top of two earlier figure-of-eight round-houses, and the walls pulled down and rebuilt and the broken portions of a rotary quernstone were placed within the wall slots of House 1, before its replacement by House II. At the early medieval unenclosed settlement at ‘The Spectacles’, Co. Limerick, a broken quernstone was deposited on top of the paving, directly in front of the door of a round-house (Ó Ríordáin 1949, 106). At Rinnaraw, Co. Donegal, broken quernstones were left on the floor beside the door, while one fragment was also placed in the doorway threshold (Comber 2006, Fig. 24). At Drumaroad, Co. Down, two broken quernstones were deposited just south of the house doorway, alongside the paving (Waterman 1956, 86). At Ballyvourney, Co. Cork, a broken quernstone fragment was deposited in a pit within the floor of a round-house used by a metalworker, while other broken quernstones and an iron spear-head were left at the base of a drain outside its doorway (O’Kelly 1952, 25, 31-2). Early medieval houses at Deer Park Farms. Broken and smashed quernstones are also known from Lisnagun Ring fort, Co. Cork; Lagore Crannog, Co. Meath; Carraig Aille I and II, Co. Limerick; and in recent excavations at Derrinsallagh 3, Co. Laois, among numerous settlement sites (O’Sullivan and Kenny 2008, 10). In anthropological terms, deliberate or structured deposits often mark key events in the life of a house—or the people within it (e.g. the abandonment of the house or the death of a key household figure). 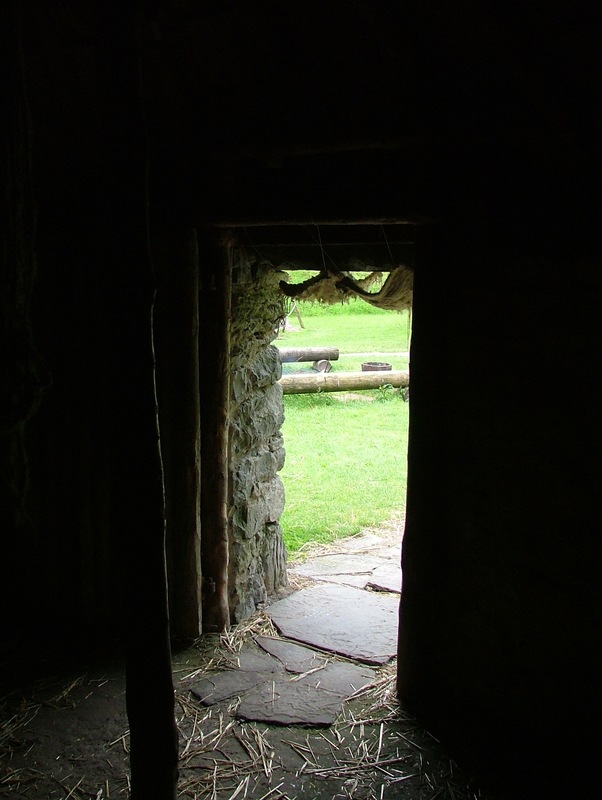 In early medieval Ireland, we might imagine that when a house itself was being abandoned or rebuilt at the end of its life, it may have been a cultural practice to deliberately ‘kill’ the household’s quern and leave it behind in the ruins. Neolithic stone axes, flint arrow-heads, scrapers and general flint debitage are also common finds from early medieval settlements and houses. In many cases, this could simply represent residual evidence, or the use of flint as strike-a-lights, and we should be wary about ascribing significance to one flint object, while ignoring the large number of flint debitage. Leacanabuaile, Co. Kerry, a prehistoric stone axe was found inside a house (Ó Ríordáin and Foy 1941, 95). At Deer Park Farms, as many as eighteen stone axes, a stone adze and a chisel were recovered from the early medieval settlement layers, mostly associated with house occupation deposits. One axe came from collapsed roofing material (McDowell 2011, 253-55), suggesting that it was suspended in some way from the roof timbers or perhaps was wedged into the thatch itself. It is likely that many of these objects were discovered accidentally during ploughing in the early medieval period and brought into houses as charms or ‘magical’ items to protect the house from fire or disaster. It is most unlikely that stone axes and arrow-heads were seen as ‘antiquities’ or objects associated with the past (a category recognition that only comes with the development of 18th century antiquarianism), but as thunderbolts or fairy darts that were often felt to have had talismanic or protective powers – as was the case across modern Europe (Carelli 1997). Flint arrow-heads were also seen in modern Irish folklore as ‘witch-stones’ having magical properties that could protect cattle, milk and butter. Estyn Evans, (1957, 300–3), noted that in recent times cattle that were not thriving were reckoned to have been ‘elf-shot’: a cow-doctor called to a stable would surreptitiously carry a few flint arrow-heads to whip out of the animal’s body at the strategic moment so as to ‘cure’ them. Calves could also be cured of various ailments such as the ‘coup’ by boiling a flint arrowhead in milk and feeding it to them. Kelly (1997, 174–5) notes that later medieval Irish manuscripts refer to the bewitching of cattle (mille ba), which may have been caused by elf-shot (urchar millte), so it seems likely that prehistoric flint arrow-heads found in early medieval dwellings represent evidence for magic and superstition. A few weeks, I was in the Pitt Rivers Museum in Oxford and went to visit an object that has been intriguing me for the last year, since first I saw it. It’s in the charms and amulets section, and it’s an Early Bronze Age flint tanged arrowhead, with a tag that says it was collected in Antrim, where it had been used to cure cattle at about 1890 or so by heating a bucket of milk with the arrowhead in it, and then feeding the milk to them…Jope, in 1952 writing about porcellanite axes in Ulster writes about how he had to persuade one household to take the axe away, as they were most anxious about the fate of their house with it gone…. Anyway, these are musings for the moment – I have much more to do to develop the subject, not least look at the archaeological data more closely, but I’ve been threatening to write a paper about “Magic in Early Medieval Ireland’…this will get me started. Carelli, P. (1997) ‘Thunder and lightning, magical miracles. On the popular myth of thunderbolts and the presence of Stone Age artefacts in medieval deposits’, in H. Andersson, P. Carelli and L. Ersgård (eds), Visions of the past: trends and traditions in Swedish medieval archaeology (Lund, 1997), 393–417. 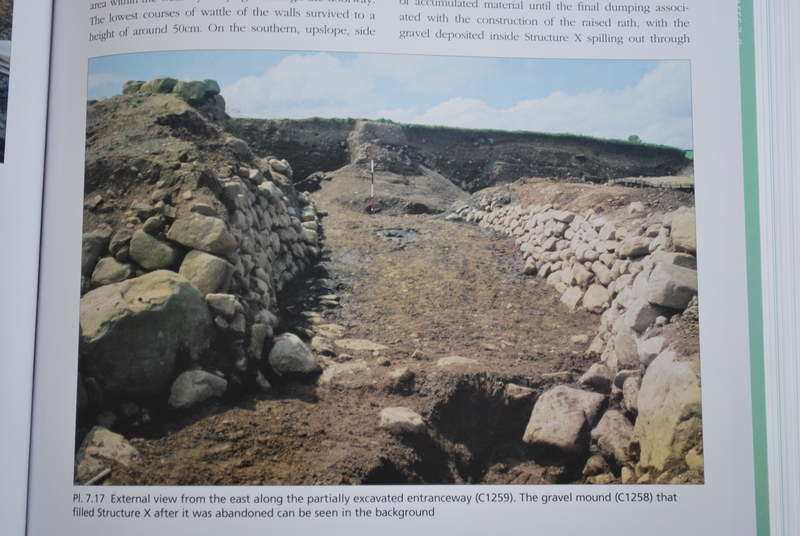 Comber, M. 2006 Tom Fanning’s excavations at Rinnaraw cashel, Portnablagh, Co. Donegal. Proceedings of the Royal Irish Academy 106C, 67-124. Collins, A. E. P. 1955 Excavations in Lough Faughan (Falcon) Crannog, Co Down, 1951-2. Ulster Journal of Archaeology 18, 45-81. Evans, E. 1957, Irish folkways (London). Fredengren, C. 2002a Crannogs: a study of people’s interaction with lakes, with particular reference to Lough Gara in the north-west of Ireland. Bray. Wordwell. Kelly, F. 1997 Early Irish farming: a study based mainly on the law-texts of the 7th and 8th centuries A.D. Dublin. Dublin Institute for Advanced Studies. Lynn, C.J. and McDowell, J.A. 2011 Deer Park Farms: The excavation of a Raised Rath in the Glenarm Valley, Co. Antrim. The Stationery Office, Northern Ireland Environment Agency. Norwich and Belfast. O’Kelly, M. J. 1952 St Gobnet’s House, Ballyvourney, Co. Cork, Journal of the Cork Historical and Archaeological Society 57, 18-40. Ó Ríordáin, S. P. 1949a Lough Gur excavations: Carrig Aille and the ‘Spectacles’. Proceedings of the Royal Irish Academy 52C, 39-111. O’Sullivan, A. 2008 Early medieval houses in Ireland: social identity and dwelling places. Peritia 20, 226-56. O’Sullivan, A. and Kenny, N. 2008. A matter of life and death. Archaeology Ireland, 22(4), 8–11. O’Sullivan, A. and Nicholl, T. 2010 Early medieval settlement enclosures in Ireland: dwellings, daily life and social identity. Proceedings of the Royal Irish Academy 111C, 59-90. Waterman, D. M. 1956a The excavation of a house and Souterrain at White Fort, Drumaroad, Co. Down. Ulster Journal of Archaeology 19, 73-86. It was one of the most astonishing Irish archaeological discoveries of modern times. 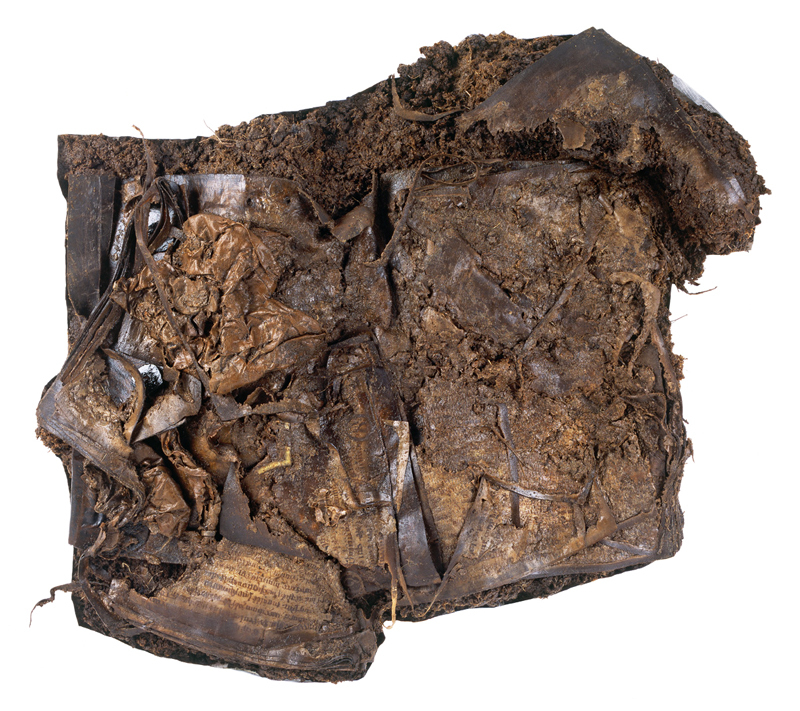 On a hot summer’s day in July 2006, a man working a mechanical excavator on a raised bog in Faddan More, Co. Tipperary uncovered – and saved until museum staff could reach it – a late-eighth century psalter, or book of psalms, that had been buried there centuries before. Perhaps amongst the most significant things about the Faddan More Psalter is not so much the text itself (which appears to be fairly conventional; would that it were a lost early Irish law tract or saint’s Life), but the materiality of the book itself. 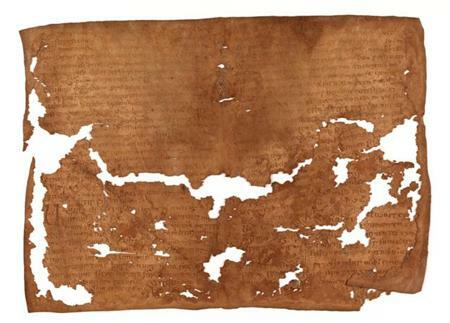 The National Museum of Ireland’s staff of conservators, under the direction of Anthony Read, working with John Gillis who was seconded from TCD Library for the project, through an extraordinary feat of conservation and analysis (see Read 2011, below), have revealed that it was originally made of sixty sheets of calf vellum (produced through careful livestock management) gathered into five gatherings (or quires). Scientific analyses have revealed that it was inscribed with black-dark inks made of oak galls and decorated of pigments like orpiment, lamp black, red and white lead. 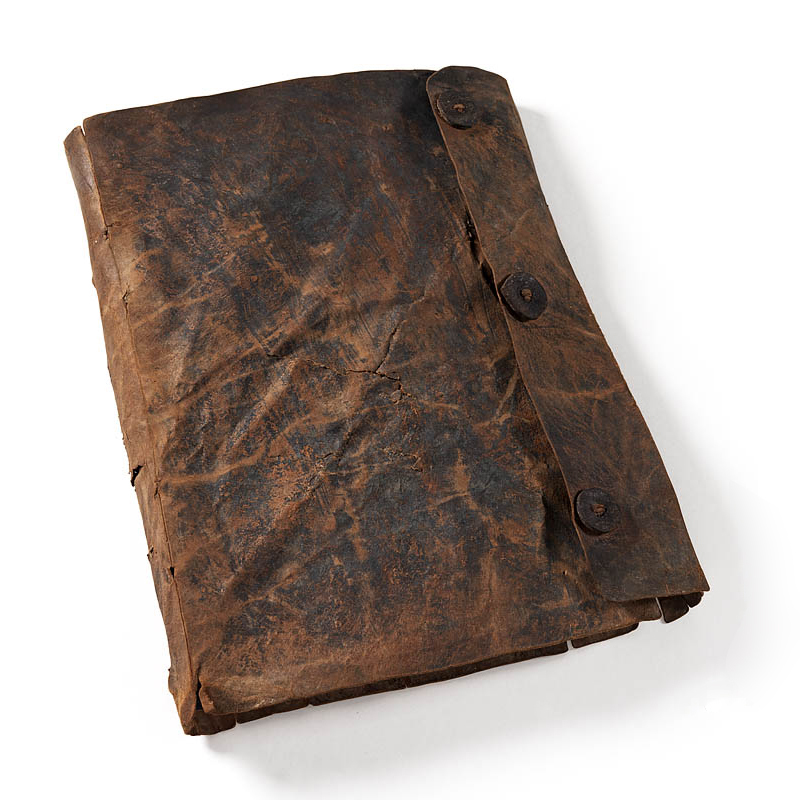 Cover of the Faddan More Psalter (Image: National Museum of Ireland). It will probably always be a mystery to us why this book was hidden in a midlands bog; was it someone fleeing danger; carrying, hiding and ultimately losing a religious book? Or was it someone making an offering to the Lord, as is suggested by the deposition of other ecclesiastical treasures in watery places; seeking some redemption or placation, seeking protection from the dreary, wet climate of the Irish midlands in the eighth or ninth centuries AD? Anyway, the Faddan More Psalter is now on exhibition in the National Museum of Ireland on Kildare Street, in the refurbished ‘An tSeodlann/The Treasury’. Overall the exhibition attempts to portray the achievements of artists, metalworkers and ecclesiastics from the late Iron Age through the ‘Golden Age’ of early medieval Ireland. It’s very professionally done and hopefully will attract plenty of international visitors, who will be fascinated, we hope, with this aspect of Ireland’s cultural heritage. I’ve visited it several times now, initially on the first day of public access and subsequently with students and on other occasions on my own. You travel to the Faddan More Psalter by firstly entering through an arch into ‘An tSeodlann/The Treasury’ (where it is good to see some old friends back on display; the Broighter Hoard looks particularly well and you can now view the boat clearly from all sides). The Faddan More room though, is really a new and very exciting exhibition about the advent of literacy in early Ireland, with the Psalter placed in the context of early writing, with a bilingual (i.e. with ogham and Roman lettering) ogham-inscribed pillar from Killeen Cormac, Co. Kildare (possible the site known as Cell Fine Cormaic, where according to the Vita Tripartita, one of the earliest missionaries to Ireland, Palladius, left his writing tablet, books and relics of SS Peter and Paul), bookshrines (including the Lough Kinale bookshrine), replica manuscripts, and a review of early medieval writing technologies (such as the Springmount bog, Ballyhutherland, Co. Antrim wax tablets, on which are written the Vulgate texts of Psalms 30-32). Some of the ‘pages’ of the Faddan More Psalter itself will be periodically exhibited in the middle of the room (in a clever touch, you can view the ‘pages’ from both sides). You can also see the leather book cover or satchel on its own. There is plenty of other material too; including a short video (based on the excellent TV programme, which can be purchased as a DVD – which I’ve already used in undergraduate lectures); as well as a poster style display explaining the context and circumstances of the find and its conservation. Perhaps, just perhaps, the architectural scale of the exhibition panels somewhat overwhelms the impact of the much smaller Psalter pages and its cover. I sat for a moment on one of the benches (always a nice touch to have places to sit down in museums…) and watched some visitors for a few minutes. Several people walked around the exhibition paying little regard to the Faddan More Psalter itself in the centre of the room and several stood reading the posters with their backs to the book cover and exhibited vellum pages. It seemed, well, wrong, somehow..it made the cover seem small, fragile..vulnerable. But of course, it is vulnerable, so I presume the large poster stand acts to protect the psalter pages further from light. It is a fantastic exhibition though and an excellent addition to the National Museum of Ireland’s displays on early medieval Ireland. If you want to gain a sense of the power of the book, and the word, in the transformation of Ireland during the early Middle Ages, go and see it. There are also a range of publications to go with the exhibition. These are well-written, brilliantly illustrated and will undoubtedly travel the world themselves. The Deer Park Farms early medieval farmstead is published, it's a big one - even if this is an espresso cup for scale! A thousand years ago, generations of an early medieval (or Early Christian) community living at a place known today as Deer Park Farms, near Glenarm in the Antrim Glens, built, occupied and ultimately abandoned an early Irish rath, ringfort or settlement enclosure. They inhabited this farmstead between the seventh and the tenth centuries AD, building up layers of occupation and leaving behind them physical traces from hundreds of years of peoples’ lives, daily work, economy and material culture. Between 1984 and 1987, the Deer Park Farms raised rath was entirely excavated by Chris Lynn (then of the Historic Monuments Branch of the Dept. of the Environment) and his team, in advance of local farm improvements. Digging down through the raised rath, to its lowest, waterlogged levels, they uncovered startlingly well-preserved post-and-wattle houses, beds, occupation floors, crafts debris and artefacts and palaeoecological evidence for diet, economy and environment. It is without doubt, amongst the most important Irish archaeological excavations of modern times – and its scientific publication has been eagerly awaited by many. 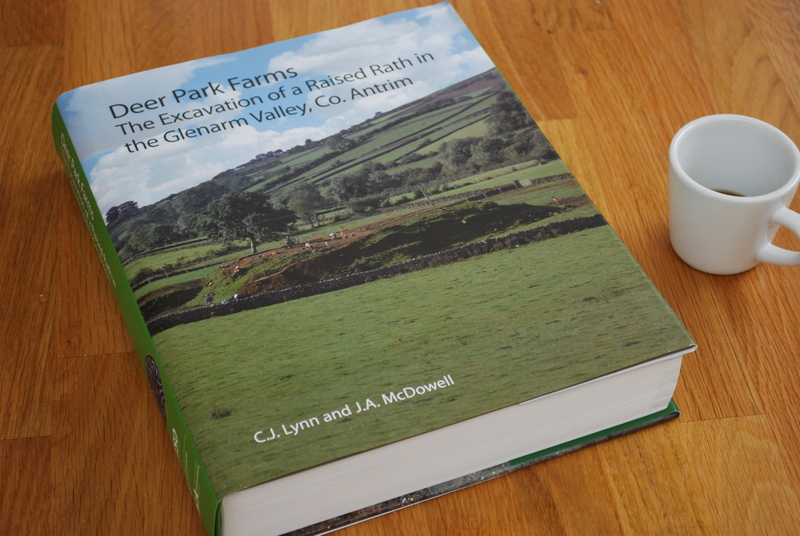 Indeed, this publication on the Deer Park Farms excavations looks set to shape a generation of academic debate and popular ideas about early medieval Irish society – and we will be reading and utilising this book for years to come. In this first post, I’m just going to quickly sketch out the character and contents of the book, later I’ll return for a more detailed critique and review (I have been given an advance copy to review; this is just a first comment). Firstly, this is a book lover’s gem – it is handsomely and lavishly produced by The Stationary Office (TSO), with an attractive dust-jacket and cover and it is stuffed full of excellent images; maps, plans and sections – abundantly using colour thoughout and the drawings are clear and well-done. There is abundant colour throughout: This is Pl. 7.5 Early medieval houses Structure Zeta and western side of Structure x, from south. From here we can see the collapsed wattle wall of Structure Zeta to the left, and the bedding area (C1291) at the bottom right, inside Structure X. 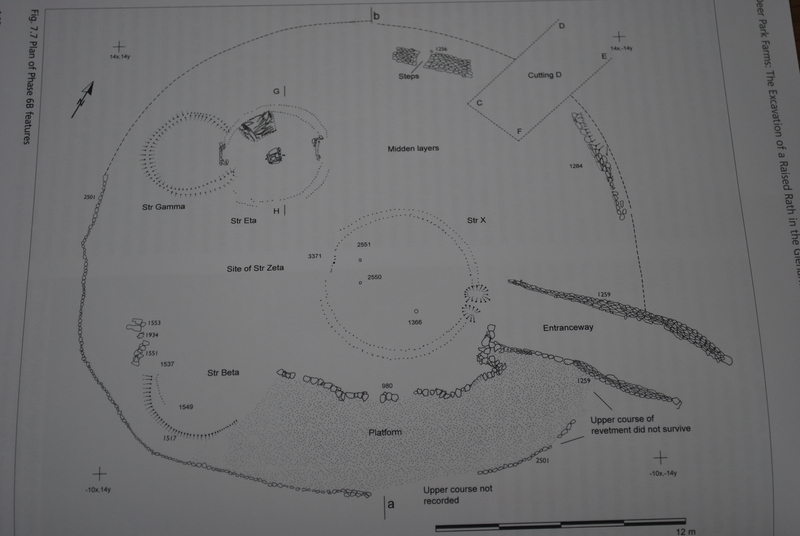 Indeed, in keeping with recent publications on Strangford Lough and the Nendrum early medieval tidal mill, the Deer Park Farms monograph has a huge amount of colour and black-and-white plates (see above). It is also physically a thumper of a book – weighing it at 6 lbs, 10 oz, a respectable size for a new-born baby! In terms of its contents, of more later, we have it all here, from detailed site descriptions, to analysis of all phases of occupation, to comprehensive artefact studies and incredibly detailed – and innovative – palaeoecological studies. We then move on to the description of the site excavation: Chapter 5: Pre-rath features (McDowell & Lynn); Chapter 6: Rath Period Phases 2-5 (McDowell & Lynn); Chapter 7: Rath period, Phase 6 (McDowell & Lynn); Chapter 8: Raised rath period, phases 7-9 (McDowell & Lynn); Chapter 9: Raised Rath periods, phases 10-13 (McDowell & Lynn); Chapter 10: The souterrain period and later activity (McDowell & Lynn); Chapter 11: Deer Park Farms (Hurl) and Chapter 12: An analysis of the radiocarbon dates (Warner). A quick photo (never good for line images) of the site plan of phase 6b features. But even this plan can be used to explore early medieval concepts of space and privacy. Look at the way the entrance ramp leads straight to the house doorway, architecture to guide movement and access. Then, we have a series of chapters that explore key aspects of the site’s environment and economy: Chapter 25: The use of woodland in the houses (M. Neill); Chapter 26: The animal bones (McCormick and Murray); Chapter 27: The condition of Deer Park Farms hair and potential for stable isotope investigation (A.S. Wilson); Chapter 28: Environment, Activity and Living Conditions (Kenward, Hall, Allison & Carrott); Chapter 29: Pollen analysis (D.A. Weir); Chapter 30: Dendrochronology (Baillie & Brown). Finally, Chris Lynn and Jacqueline McDowell return to the fray to offer us some summative and reflective chapters, placing the site in its historical, cultural and social contexts: Chapter 31: The evolution of the mound (Lynn & McDowell); Chapter 32: Literary and archaeological contexts (Lynn & McDowell); Chapter 33: Reconstruction of an 8th-century house based on evidence from Deer Park Farms (Lynn); Chapter 34: Críth Gablach and the status of the rath occupants (Lynn & McDowell) and Chapter 35: Retrospect (Lynn & McDowell). We also have an extensive bibliography, an index of the contents and a fold-out of a cross-section of the entire raised rath and enclosing ditches, all in colour and annotated. For many of us in Irish archaeology, the Deer Park Farms early medieval rath has long been a subject of fascination and interest. I remember (many years ago) returning home one evening from UCD, where I was a First Year Archaeology undergraduate student, and watching a brief TV programme, on UTV, about the excavations. For years afterwards, I read everything I could about the site or attended Chris Lynn’s lectures – not least because of its waterlogged wood. Latterly, as a Archaeology lecturer at University College Dublin, I have used the Deer Park Farms in countless lectures and academic papers (well, not countless) to illustrate how early medieval people might have understood and organised their dwellings. Indeed, I could see myself using this book next year to prepare 5-6 lectures or seminar/workshops about early medieval Ireland! Finally, while we were working on our reports on early medieval settlement and dwellings for the INSTAR-funded Early Medieval Archaeology Project (EMAP), we were well aware that this was going to be a key publication for our understanding of early medieval settlement archaeology. It would not be an exaggeration to say that this is a key publication for our understanding not only of Northern Ireland’s history and cultural heritage, but also that of the entire island, these islands, and indeed of lives and practices of people in early medieval Europe, c.AD 600-1000. 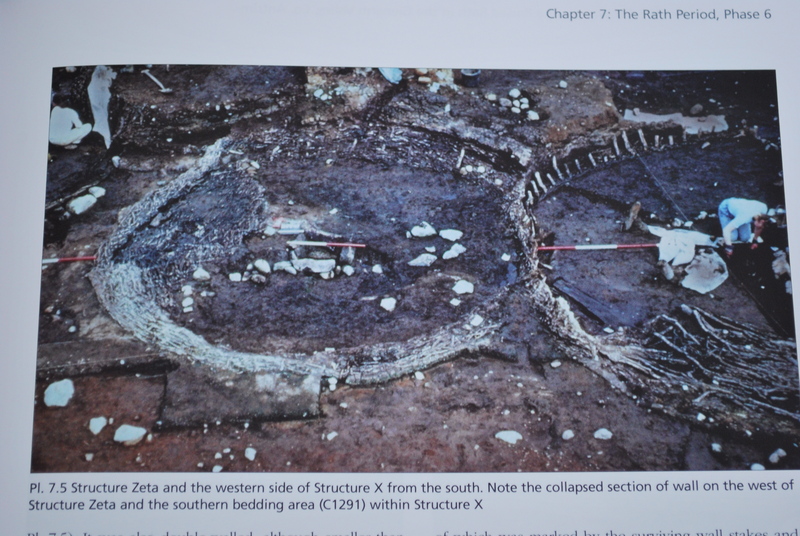 It is also a testament to the significance of Irish archaeology in international terms and of the skills and patience and persistence of its authors – all credit to them.We will return to the Deer Park Farms early medieval raised rath excavations publication again…there is much to say. View of the partly-excavated entrance way (C1259) into the rath, kept clean the authors tell us, as might be expected of the paved entrance or airdrochat described in early Irish sources. This book provides us with unique access (see what I did there?) into an early medieval settlement of the 7th to 10th centuries AD.